Mike Moore | The Journal Gazette Homestead 's Zachary Zishka, shown during a practice this month at Summit Middle School, has his eyes on finishing in the top eight at this year's state finals. Note: Angola, DeKalb, East Noble and Wawasee will compete in the Northridge Sectional, with the same schedule as the South Side Sectional. Adams Central, Bellmont, Bluffton, Norwell and South Adams will compete at the Jay County Sectional. 5 to Watch The biggest question of the postseason is whether or not Carroll can take advantage of Homestead's loses and reclaim the sectional title for the first time since 2015, but there will be plenty of other points of interest in the pool this postseason. 1. An individual state champion in our midst? Carroll's Noah Yarian and Tristan DeWitt each placed in four events at the state meet last year and finished second in at least one. Will one (or both) of them be able to win at IUPUI's natatorium? 2. Will the Cadets be represented at state? 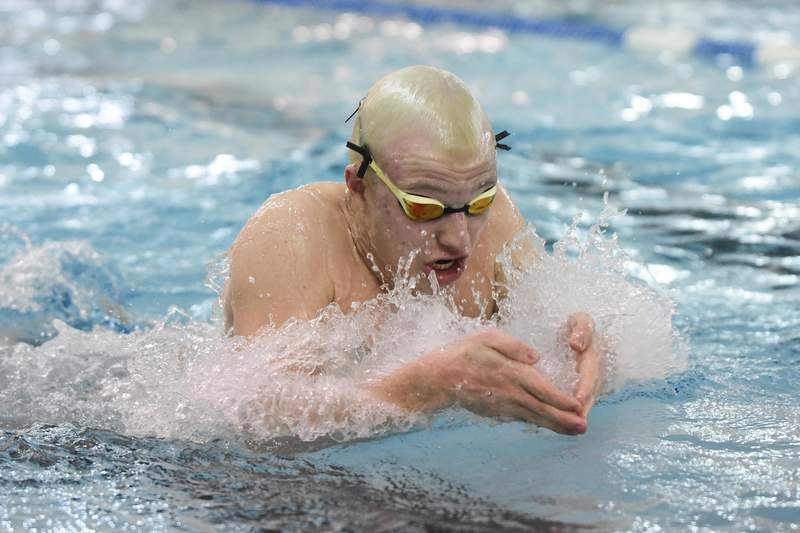 Although Carroll and Homestead dominate the sectional swim scene, Homestead coach Justin Max said he's been impressed in recent seasons by Concordia, which won the boys SAC title last month by winning the 200 medley relay and 400 free relay. After narrowly missing out on a state berth in the relays last season, the Cadets will be motivated to change that this year. 3. Will diving be the difference? Snider diver Connor Mihavics was the only athlete from a school outside of Homestead and Carroll to win an event at last year's sectional meet. But one of the leading contenders in the 1-meter dive, Carroll's Ethan Hunnicutt, was injured in a car crash just before sectionals and was unable to compete. Now that he's back this year, will his performance be enough to push his Chargers to sectional title? 4. How far can Loran go? South Side's Jaeger Loran, who sometimes trains with the Homestead swimmers during the club swimming season, qualified for the state meet in the 100 backstroke last season. Could a strong swim take him back to the state finals? 5. How will Homestead hold up at state? Regardless of whether or not the Spartans defend their sectional title, Homestead will need another strong showing by Julian Norman and finals appearances by Zachary Zishka and Cameron Luarde to rank among the top eight teams at state, which the Spartans have done in each of the last three years. With a week to go until the boys sectional swim meet, the Homestead training program is all over the map. Zachary Zishka, who swims the 200 and 500 freestyle, is focusing on pacing and distance work. Sprinters such as Cameron Luarde are doing lots of resistance training. Swimmers such as Noah Sackett, who aren't necessarily expected to qualify for the state meet but could pull in crucial points for their team at sectionals, are already starting to taper off their training. The Spartans – who, at the moment, all sport the same bleach-blond hair as part of a team-bonding tradition – have long been the dominant power in local swimming, winning 22 sectional titles since the 1994-95 season, including the last three. But winning a fourth straight will be tougher than in past seasons. Despite the seemingly diminished outlook, Zishka said he's been encouraged by the way younger swimmers have filled in some of the spots left open. Max said that Luarde, a sophomore, and Spencer Koehrn have epitomized that “next-man-up” mentality for the Spartans. The Spartans can still rely on Julian Norman, who placed in two individual events and a relay at the state meet last year, finishing as high as fourth in the 200 freestyle.